For Black Belts ONLY ! Reflects and honors the 7 virtues associated with Bushido, a powerful greeting to praise the courage of all black belt holders across the world, who, for centuries, have embodied the samurai warriors code through the initiation and practice of an ancient martial art. Developed and manufactured in Switzerland, the Black Belt Watch is solely reserved for black belt holders, regardless of the martial art style. Each practitioner has to provide an official rank certificate. Black Belt Watch supports the "Little Dreams" foundation and donates a percentage of its sales to the "No Difference" cause, a program that aims to grant young people with a handicap, the chance to realize their passion for a martial art. 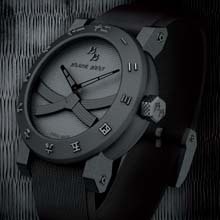 As a tribute to the Bushido code of conduct and its 7 virtues, the black belt fighters, Claudio Alessi and Yvan Arpa, teamed up with Swiss watchmakers and created a timepiece cloaked with Gi Rectitude – Yu Courage – Jin Benevolence – Rei Respect – Makoto Honesty – Meiyo Honor – Chugi Loyalty. The renowned Martial Arts master, Claudio Alessi gained the World Championship title along with those of several European and Swiss Championships. This multi style Sensei who is a Mixed Martial Arts instructor has also developed a specific technique to teach Martial Arts to disabled people. After 14 hard fought karate final matches, with and against his friend and competitor, Yvan Arpa decided to leave the tournaments’ tatami mats and join the challenging Swiss watchmaking scene. His sharp marketing vision fueled for success Sector No limit, the Hublot Big Bang and Romain Jerome, where he created an overnight sensation with the “DNA of Famous Legends” concept. He produced two collections “Titanic-DNA” and “Moon Dust-DNA”. Both became bywords for innovation, daring design and superb craftsmanship. 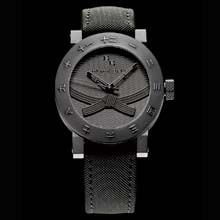 The Black Belt Watch’s is an eloquent expression of his creativity, brimming with symbols and emotions.